Star shaping is a valuable technique you can use in Photoshop to make the stars in an astro image look more attractive. Raw digital astro images from film or CCD tend to have lower contrast than is generally needed for printing or web display. During processing, we increase contrast, using curves. Increasing the contrast darkens the background and boosts the brightness of the bright features. The brightest features of a properly exposed astro image are the bright stars. Boosting the intensity of stars in an image tends to bloat their size, give them a “burned out” appearance, and wash out their colors. We want to increase the overall contrast, but we also want our stars to be pinpoint, with colored halos that blend smoothly into the background. Star shaping is the way to accomplish that. This technique can be used with telescopic and wide-field images from both CCD and film. Figure 1a. This image section has not had its stars shaped. Move mouse cursor over this image to see it shaped. Figure 1b. The section has had its stars shaped. Stars are softer and have more colorful halos. Click here for complete image. When we use the term shaping here, we do not mean that the face-on profile of the star will change from circular to, say, polygonal. The face-on star profile should start circular and stay circular. In the context of this article, the “shape” of a star is what you would see looking at the star “from the side”. This can be presented as a plot of luminescence versus distance from the center. Because the star center is saturated/clipped, it will have a flat mesa top at the center, which is a pure white in color. Figure 2. Star Shapes. The yellow curve represents the actual unshaped profile of the centermost bright star in the image above. The blue curve is the same star after shaping. Shaping rounds off the mesa. The shape of an individual star usually won't be very discernible unless you zoom to high magnifications. But even when you zoom all the way out, star shaping can show a noticeable effect – the stars look softer & rounder and less dominating. Figure 3a. High magnification of stars in raw uncurved image. Figure 3b. Unshaped stars in curved image. Move mouse cursor over image to shape it. Figure 3c. Shaped stars in final image. What colors can stars have? This is somewhat of a subjective area, but I would say: amber, pale yellow, white, and light blue. The coolest stars that are intrinsically orange or even near-red, are rarely bright enough to get clipped. 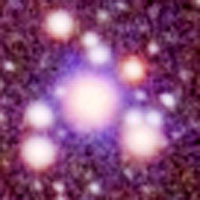 If a star halo appears pink, it should be primarily because it's embedded in red H-alpha nebulosity. 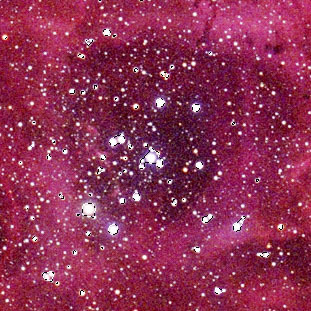 There are stars that appear magenta (AE Auriga) because they're embedded in combination H-alpha/reflection nebulosity. Green stars are the rarest and occur only in intense O-III nebulosity (Veil Nebula). Stars have colored halos also because of chromatic aberration in the optics or the atmosphere, scattering due to haze, poor seeing, diffraction/magnification, or differential halation in the film. Brighter stars tend to appear larger in an image. Colored halos can be used to advantage by the astrophotographer, and shaping can help. For example, Bill and Sally Fletcher have refined a shaping technique of deliberately placing a glass haze filter over some of their wide-field shots to increase the star halo sizes and color. The stars we want to shape are the bright ones. The bright stars are the ones that get burned out by the main curves, which can be seen as clipping in the histogram. Their centers are pure white and will have levels of 255/255/255 or near to that. (This happens more often with slide film than with negative film due to limited dynamic range.) Star shaping should not try to make the star centers dimmer. The bright stars will have colors in their halos only. Stars that aren't clipped do not need to be shaped. Figure 4a. 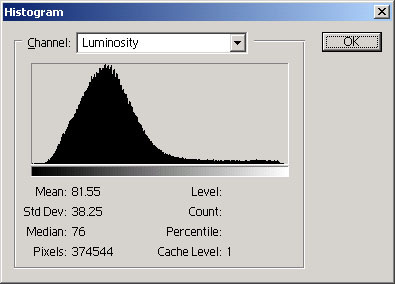 Histogram of image section with unshaped stars shows clipping. See spike at far right of chart above. Figure 4b. After stars have been shaped, there is no clipping. This star shaping technique uses Photoshop adjustment layers. Each adjustment layer applies a processing step. The layers apply to the image in a sequence starting first with the lowest layer (the "background", your raw image) on up to the highest layer of the layer stack. Layers only work in 8-bit mode. Adjustment layers were introduced in Photoshop 5.0. The user interface organization of Photoshop releases 5.0 & 5.5 will be slightly different than shown what's shown here for Photoshop 6.0. Starting with a raw image that has well adjusted levels, create a main curves adjustment layer that gets the image fairly close to the look you want. Create the main curves layer with Layer -> New Adjustment Layer -> Curves, name it "main curves" and select OK. Adjust the curves until the image looks good, then click OK. When you create a layer, it automatically gets an all-white mask. Get rid of the mask from the main curves layer with Layer-> Remove Layer Mask -> Discard. You can see the layer stack with Window -> Show Layers. You can go back to adjust any layer at any time by double-clicking on it, which is a key motivation for using layers. The layer stack shows the original image contained in the Background layer. 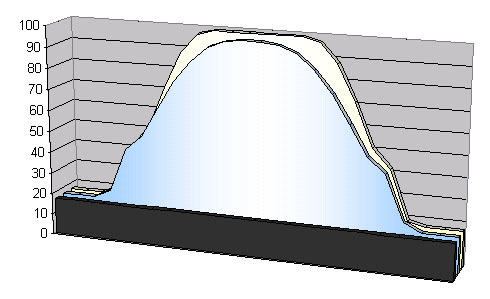 The main curves have been applied as an adjustment layer. Now use magic wand to select the stars. Do that by first setting the magic wand options to “not contiguous” (in PS 5.5 and higher), "Use All Layers" on, and the Tolerance to 60 or so. Select the background layer by clicking on it in the layer stack. Zoom to 200% using the Control-Plus and Control-Minus keys. Click on the center of a typical bright star. In Photoshop 5.0 and earlier, the Select -> Similar operation selects the rest of the stars. Most of the bright stars should now be selected. Do not worry about the dim stars, as they shouldn't be clipped by any reasonable set of main curves. Figure 5. Selection of stars after feathering. Now you should review the selections across the entire image and subtract any non stellar selections (e.g. using lasso). After you have refined your selection, feather (Select -> Feather) it by 4 pixels or so. That helps soften the effect. Now your selection should be all set. 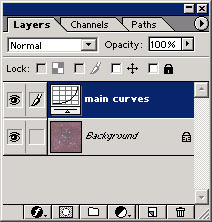 Select the main curves layer by clicking on it once in the layer window. Install the selection as a mask into this layer with Layer -> Add Layer Mask -> Hide Selection. That tells the main curves layer not to adjust the stars. The selection disappears when you do that. Load the selection back (from the main curves layer) with Select -> Load Selection, and making sure to invert it. 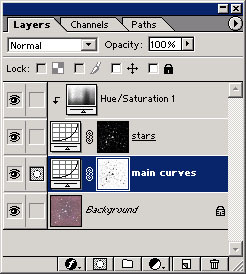 Now create a new curves adjustment layer, and name it "stars". The selection automatically becomes the mask of that layer. The stars layer now controls the curves of the stars, while the main curves layer controls the curves of the rest of the image. 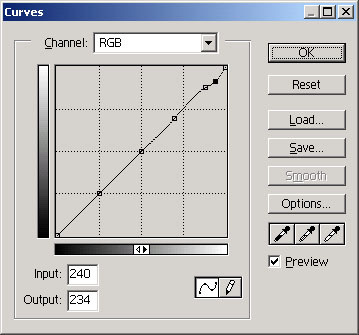 Make the stars layer RGB curve look something like the illustration below. You'll need to use your judgment to adjust it. You want to use the preview feature and look at the image zoomed at high-magnification. You want to make any hard edges in the star images softer. 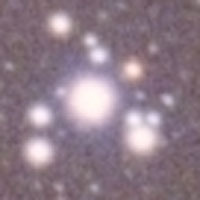 Star shaping should not make the star centers dimmer, although when zoomed out you may get the impression that stars are being made dimmer. The star colors should appear very slightly more colorful. Figure 7. Example Star Shaping Curves. This is all it takes to round off the mesa shown in Figure 2. Now here's the last step of this technique, which creates another adjustment layer that increases the color saturation of the stars. Click on the stars layers in the layer window. Now select Layer -> New Adjustment Layer-> Hue/Saturation, check "Group With Previous Layer" and click OK. Adjust the saturation to +70 and click OK. You should now have very colorful soft stars. Here's how the layers should look when you're done. When you have finished adjusting all the layers, you can flatten the image and save it as a TIFF file. However, I recommend instead that you keep the layers intact and save the entire layer stack as a PSD file. This will enable you to open the image up later and adjust any of the layers. You can always save a TIFF or a JPG copy or do a print directly from the PSD file without explicitly flattening it. Star shaping has limitations. Firstly, if the stars are already significantly clipped in the starting version of the file, you are going to be limited in what you can do. Your best bet may be to scan again with corrected parameters so as to get an unclipped image. You do not want to see sharply defined halos around the stars. If you see that, you have overdone the shaping. Sometimes it is best to deselect stars that are embedded in nebulosity and shape them in a separate layer, if at all. Shaping stars without nebulosity is relatively easy, for example, the Double Cluster. That would be an easy subject on which to practice this technique. Figure 8. Excessive shaping yields sharply defined circles around stars. Sometimes a star is very bright and very big. The shaping method described above may not be adequate. There's an ace you can pull out of your sleeve. Use unsharp masking on those stars/halos. I'm not talking about Photoshop's “unsharp masking” filter, but rather the classical method (again using layers) that is well documented by Jerry Lodriguss. If you want to see an image where unsharp masking was used to control the shape of bright stars, see this Running Man shot. Star shaping gives you smaller softer stars with more colorful halos. It helps create an impression of high-resolution. By making stars smaller, shaping can actually “split” stars that would otherwise overlap. Shaping can also be used to mute the stars somewhat when they overwhelm other features in the image. Not every image needs star shaping, but in many shots, star shaping helps make the image noticeably more pleasing to you and your viewers. MATT BENDANIEL ( ) has published images in Sky & Telescope and elsewhere. A gallery of his images can be seen at http://starmatt.com.